Mediawiki vs SharePoint. What is the best Wiki software? 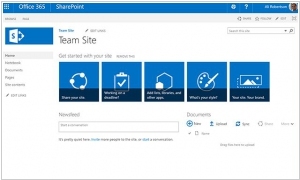 Following the release of free MS Office extension for creating internal collaborative web-sites SharePoint Team Services, Microsoft has uveiled a full-fledged (and paid) enterprise portal SharePoint Portal Server 1.0, that will compete with portal solutions from IBM and Oracle. SharePoint Portal Server enables companies to create internal portals for collaboration and data access from both local and external sources. In particular, the portal includes tools for document management, search and creating sites with the help of Web Parts technology. It uses IIS web-server and Web Storage System (WSS) database that is used also in Microsoft Exchange. Users can access portals via web browser. Unlike SharePoint Team Services the portal provides more advanced tools for document management, version control, workflow management, search, access control and creating websites. SharePoint Portal Server is targeted primarily for medium and large companies and cost - $6,999 for a 25-user license.